Why should you do a product launch the next time you introduce a product to market? 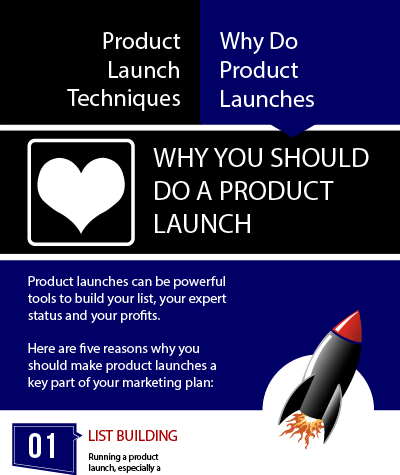 Now, it’s important to understand that “Product Launch” in this case, is a technical term, meaning a marketing launch that contains a very specific sequence of events and that contain a specific set of marketing strategies. For my recommended product that shows how to maximize your product launch success, click here. Like this infographic? Share it with your audience by embedding a copy on your blog or site using the embed code below. And, don’t forget to leave a comment, Share, Like, +1, Tweet, Tumble and Pin this post!